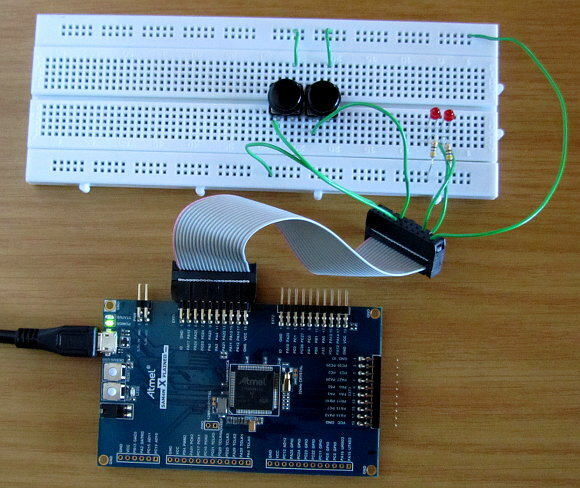 How to read and write a port or group of port pins using Atmel Software Framework. ASF is used to read two switches on a port and write the switch values to two LEDs on a port of an Atmel ARM Cortex microcontroller. The port pins for the read and write operations are accessed using ASF functions from the IOPORT module that access the port pins as a group of pins rather than individual input and output pins. ioport_enable_port() – enables the selected port or group of port pins determined by a mask value. ioport_set_port_dir() – sets the direction of the port or group of port pins as either inputs or outputs. ioport_set_port_mode() – sets the mode of the port such as enabling pull-up or pull-down resistors on the port pins. ioport_get_port_level() – gets or reads the state of a port or group of port pins determined by a mask value. ioport_set_port_level() – is used to write a value to a port or group of port pins. Two switches are connected to two port pins PC23 and PC24. Two LEDs and series resistors are connected to port pins PA11 and PA12. 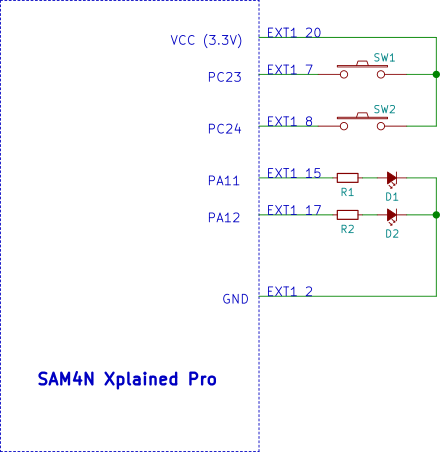 These pins are taken from the EXT1 header of a SAM4N Xplained Pro board and the circuit built on a breadboard as shown in the image below. Make the necessary changes to the hardware and port definitions in the software if you are using a different board. Switch and LED connections to the board are shown in the circuit diagram below. Create a new ASF project called in_out_port in Atmel Studio as explained in the ASF quick start checklist. Add the IOPORT - General purpose I/O service (service) module to the project using the ASF Wizard. Although the System Clock Control service is shown in the modules added to the project in the image below, it is a dependency of the IOPORT module so will be added automatically. Modify the following files in the in_out_port Atmel Studio project. Mask and offset values are defined in conf_board.h as shown in the code listing below. The offset value is used to shift the mask to the correct bit position on the LED and switch ports. Pins on port A are set up as outputs and pins on port C are set up as inputs with pull-down resistors in the board_init() function in init.c as shown in the listing below. In the main application code in main.c the state of the switches on port C are read into the port_pins variable. These values are then shifted to get them to the bottom of this variable. The switch states that are stored in port_pins are then written to the two LEDs on PORT A. It is necessary to shift these bits to the correct bit positions to line up with the LEDs connected to PORT A. The following video shows the port read write / in out application running on a SAM4N Xplained Pro board.